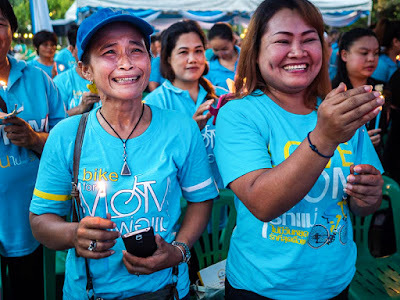 Women at a candle light service for Queen Sirikit on her birthday. August 12 is the birthday of Queen Sirikit, the wife of Bhumibol Adulyadej, Thailand's beloved monarch. He has reigned since May 5, 1950. 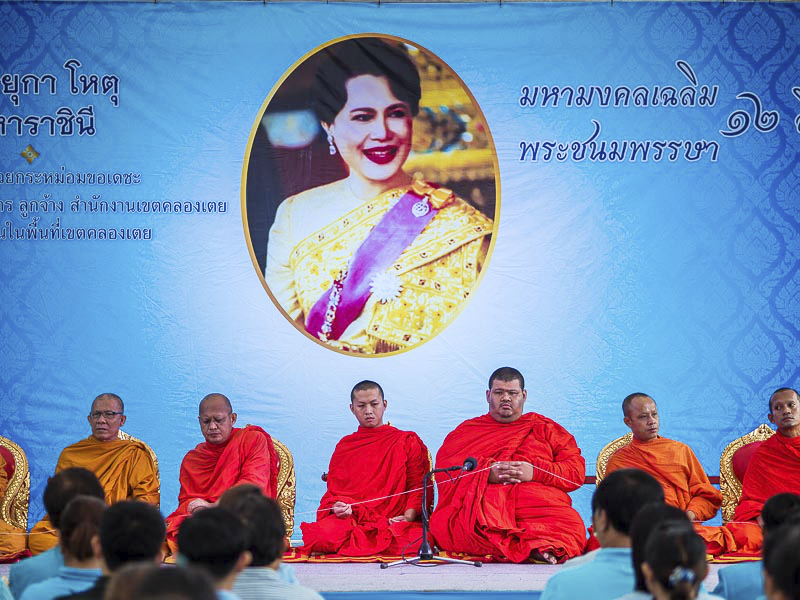 He is the world's longest reigning monarch and is Sirikit is the world's longest reigning Consort. 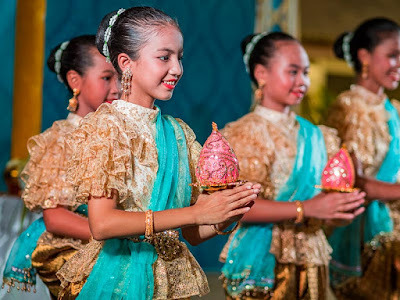 School girls perform a historic pageant in honor of Her Majesty on her birthday. The birthday of the Queen is a national holiday in Thailand. It's also celebrated as Mothers' Day. 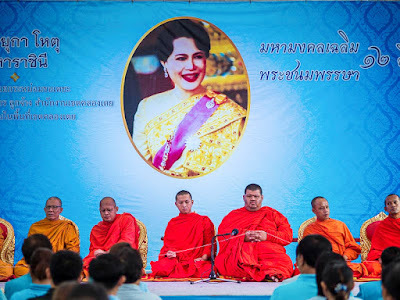 Thais of all walks of life offer prayers to the Royal Family. Schools hold special convocations to honor the mothers in the days leading up to August 12. It's a holiday people take seriously. The malls are open (the malls are always open) but many small shops are closed, most businesses and all schools are closed. Small eateries, the mom and pop ones, are closed. Street vendors stay home. After the pageant, students sang the Queen's Anthem. It's hard to explain the people's reverence for the Thai monarchy. To Americans, it seems archaic, like a throwback to another era. But to Thais it's very real. The Monarchy here is a near divine entity. 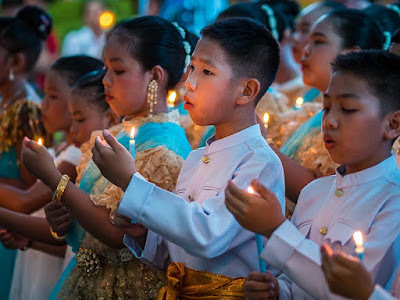 At a time when the country is split along class lines and there's a growing rural / urban split, the monarchy is one institution that unites Thais. Monks at a service honoring Her Majesty. This was Her Majesty's 83rd birthday. We went from candle light service to candle light service and I was struck by the number of them. Just within a few kilometers of our apartment there were services in the temple near us and at all of the malls on Sukhumvit Road. 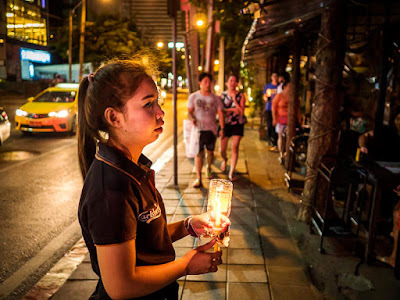 We were walking home from the Skytrain, I stumbled upon a waitress from a restaurant we occasionally go to standing in the middle of the sidewalk holding a candle. Inside, all of the patrons held candles aloft and sang the Royal Anthems. 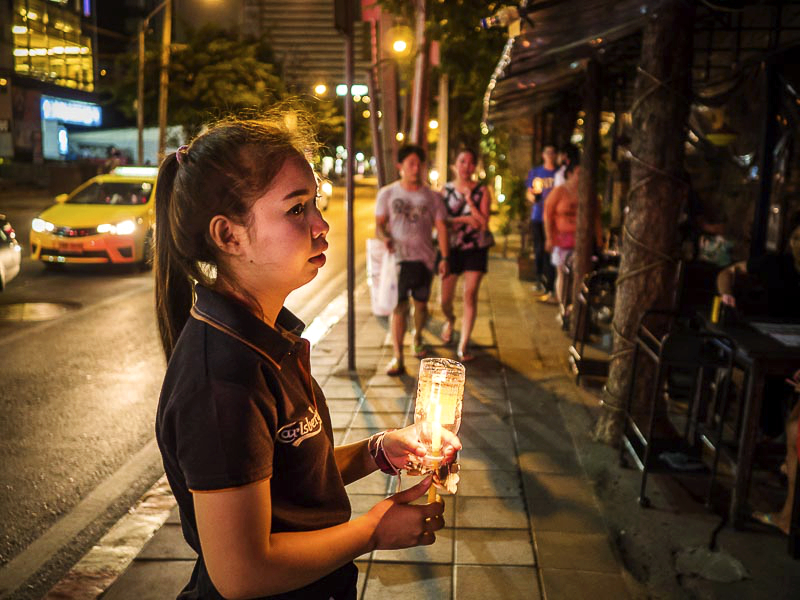 A waitress holds a candle on a sidewalk next to a popular restaurant. There are more photos of the Queen's Birthday observations in my archive.